This month, Gina Santoianni joins us from Sarasota, Florida where she is the Student Engagement Coordinator at Mote Marine Laboratory and Aquarium. Gina, to start off, please, tell us in a nutshell about your Teen Café program . . . what’s special or unique about it? I think Mote’s Teen Café program is unique in several ways. 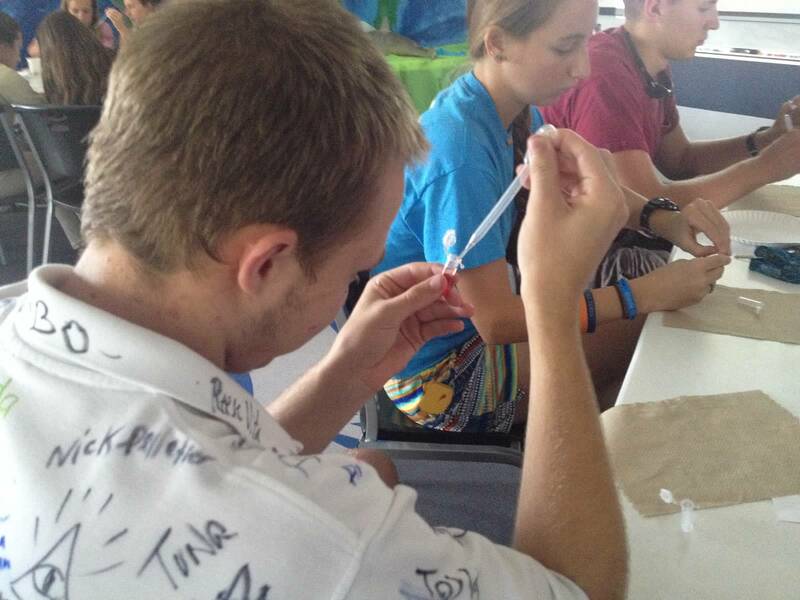 Mote participates in TSCN’s FL Teen SciCafe node with a marine science focus. It may seem that having a concentration would limit the available speakers and topics, but we have had many amazing speakers discuss everything from toxic phytoplankton to tagging great white sharks! While the focus has been concentrated on marine life, our speakers have incorporated technology, engineering, psychology, and various other STEM related topics into their presentations. Mote’s Cafés are also unique because of the speakers. Mote is a marine laboratory and public aquarium, and our staff has been enthusiastic about participating in Cafés with a marine science theme. We are lucky to have amazing speakers right at our fingertips! Tell us a little about your background . . . how did you personally come to be involved with your Teen Café program? I started as an Educator with Mote 4 years ago, and was tasked with leading the First Year High School Internship Program. 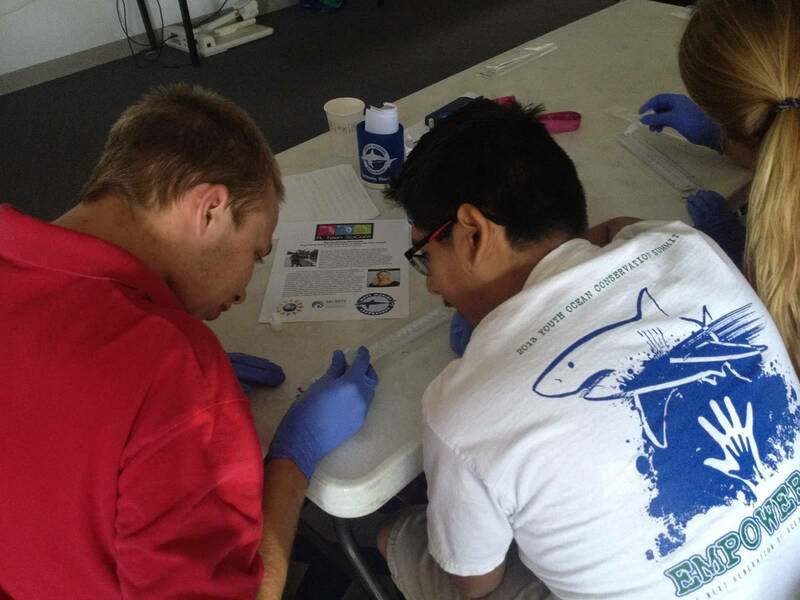 High School Interns participate in research projects, volunteer hours, and conservation events. When Mote was given the opportunity to join the Teen Science Café Network, we felt it would pair perfectly with our High School Internship Program. Now, our teens plan and lead Cafés as part of their internship. How do you see the Teen Science Café program fitting within the mission of your institution? Mote’s mission is about advancing marine sciences through research, education, and outreach. The Teen Science Café program translates Mote’s research and the research of local marine scientists to students, resulting in a greater understanding of our marine resources. One of the most amazing things about these Cafés is that students are learning information that is so current that it is not yet in any textbooks or in any science curriculum. Students can then take this information into the classroom to share with their peers and teachers, broadening Mote’s outreach efforts. Ultimately, our society will benefit from informed citizens making informed choices where our way of life is tied to the future of our marine resources. TSC is one way to bring the importance of these resources to our future voters, leaders, and stakeholders. What is the biggest stumbling block you have encountered as your program has developed? We already had student leaders, a variety of potential speakers, and support for Teen Science Cafés when we started, but one thing we are still modifying is the convenience of the program for students. Teens are so busy with afterschool activities that it can be difficult for them to squeeze one more into their schedule. We have tried holding Cafés at different times on different days and in various locations. After realizing there was no way we would suit everyone all the time, we decided it was better to schedule the program consistently so students could better plan to attend. Our Cafés are held on Wednesday afternoons. We have found that students’ schedules change throughout the year. So if a student isn’t able to attend Cafés, say in the fall due to sports, sometimes they are able to coordinate their winter or spring schedules so as to be available on Wednesday afternoons in anticipation of the already scheduled Cafés. What was your favorite Café? What made it so? We have had many amazing speakers share their work over the past several years. That said, if I’m able to just choose one Café, it would have to be Marine Mammal and Sea Turtle Stranding Reponse: The Good, the Bad and the Smelly. Gretchen Lovewell, Mote’s Stranding Investigations Program Manager, and her colleague, Rebeccah Hazelkorn, spoke about the Strandings Investigation Program that provides 24 hour response to sick, injured, and deceased marine mammals and sea turtles. Gretchen and Rebeccah are responsible for recovering and transporting stranded cetaceans (dolphins and whales) and sea turtles to Mote’s rehabilitation hospitals where they are treated and released. Deceased animals receive a detailed post-mortem examination. Gretchen and Rebeccah told numerous stories about their experiences, some exciting, some gruesome. A common theme throughout the Café, however, was human-related activities and effects on wildlife. The students gained a strong understanding of how pollution, marine debris, and boat traffic affect marine animals. One story hit particularly close to home and many students were able to relate. A dolphin, dubbed “Begger” by locals, had recently been found dead. He was a young, active dolphin that should have had a long life, but was very unhealthy due to human interactions. Begger was known for approaching boats, and people assumed he was begging for food, so would give him snacks or bait from their fishing lines. When Begger finally passed away, the Strandings Investigation team performed his necropsy. They found fishing hooks, ulcers and bits of food not associated with bottlenose dolphin diets, so his death was directly related to people feeding him. Students learned the harsh lesson not to feed wild animals. Following a necrospy with the Stranding Investigations team, cetacean bones are cleaned, examined and cataloged. Gretchen and Rebeccah actually brought several skeletons for the students to articulate. 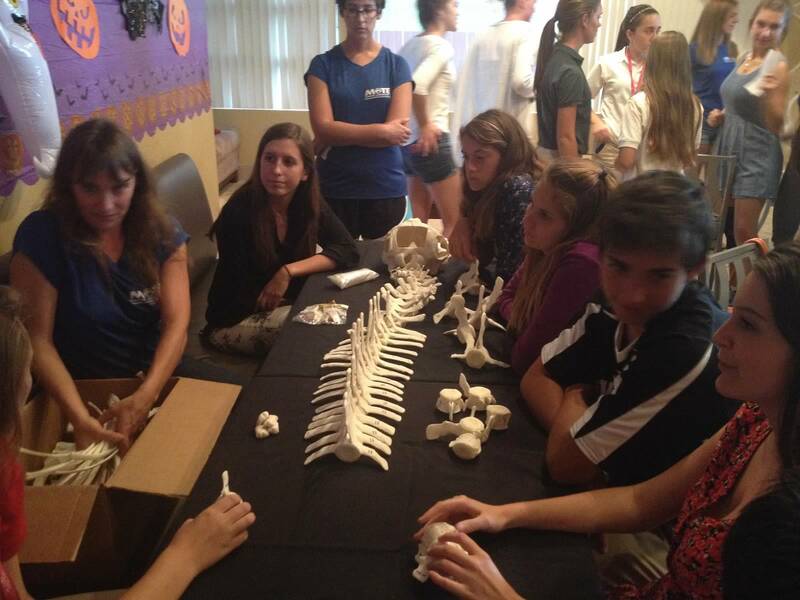 By examining the bones, students were able to tell that they had just assembled the skeleton of Begger the dolphin. After the cafe, students said this hands-on activity was the best they’d had to date. In general, what do you like best about your program? I enjoy watching the student leaders take responsibility for the program. When they are given creative input, they become much more involved and engaged. While discussing improvements to the Cafés, our teen leaders made suggestions about being more inclusive with new attendees and speakers. At the next cafe they were sure to greet the speaker upon her arrival and sit at tables with new students. Watching the student leaders gain this maturity and confidence has been very rewarding.